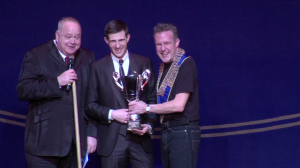 Tayto Park magician Brian Daly takes bronze at the worlds biggest magicians conference! As part of Tayto Parks ongoing commitment to providing visitors with high quality attractions and entertainment, they can now boast a bronze medallist in family entertainment, won by resident Tayto Park magician Brian Daly. The competition took place in the world famous Blackpool Opera House. Officially titled “The British Children’s Entertainer National Championships 2014″ and is the biggest competition of its kind in the world. It’s run as part of the world’s biggest magicians conference. Over 3,000 magicians attend the conference every year from around the world. The audience at the competition were a mix of magicians and the public. With the winners being decided by an audience vote, so Brian had no home advantage. Many magicians who watch the competition every year, and the conference organisers themselves, remarked that the standard was the highest it’s been in years. And any of the children’s entertainers this year would have been strong enough to win in any of the previous years. If you want to see Brian’s award winning magic act come visit Tayto Park! Tayto Park has plans to expand it’s live entertainment facilities, and together with a new award winning resident Tayto Park magician, the future is looking magical.